While we consider the Protestant Reformation to have been formally begun in 1517 with Luthers’s “95 Theses ” the Official counter reformation is considered to begin with the Council of Trent 1545-1563 yet, long before the Roman catholic Church, began its formal response many theologians dressed the subjects at the heart of this great schism. 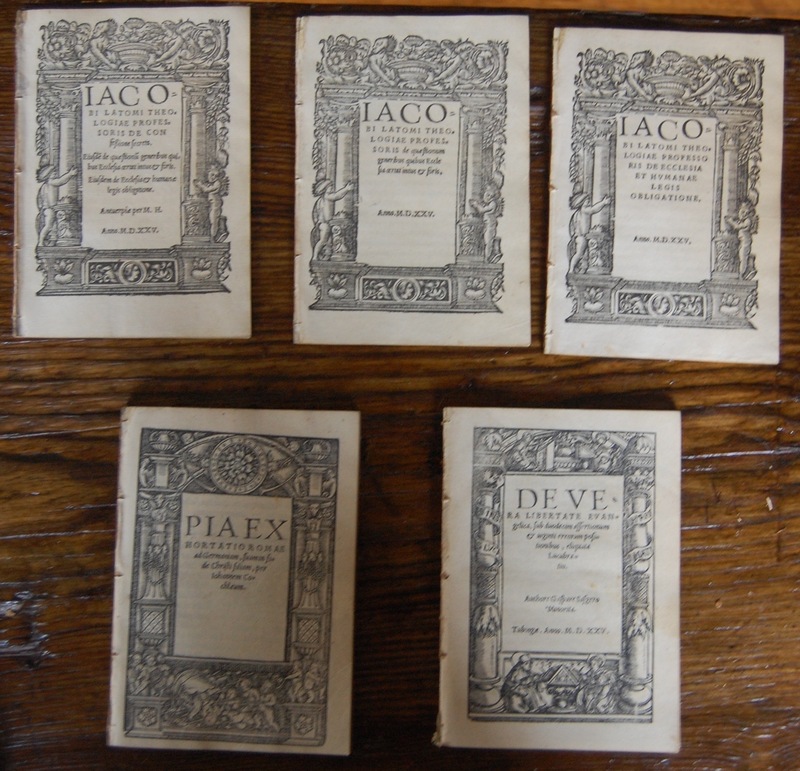 The five tracts I offer here are specific responses to these Reformation objections. Iacobi Latomi Theologiae Professoris De Confessione secreta. (with) Eiusde[m] de quæstionu[m] generibus quibus Ecclesia certat intus & foris. (with) Eiusdem de Ecclesia & humanæ legis obligatione. The De confessione secreta (Antwerp, 1525)An attack on Johannes Oecolampadius and Beatus Rhenanus. Latomus was a theological adviser to the Inquisition, and his exchange with William Tyndale is particularly noted. The general focus of his academic work centered on opposing Martin Luther and the Protestant Reformation, supporting the divine right of the papacy and the hierarchy of the Roman Catholic Church Nijhof-Kronenberg 1325. Pia exhortatio Romae ad Germaniam, suam in fide Christi filiam, per Iohannem Cochlaeum. 819G Schatzgeyer, Kaspar, 1463 or 1464-1527. Schatzgeyer was born at Landshut in Bavaria in 1463 or 1464. For many years he was guardian at Munich, and since 1517 first provincial superior of the Strasbourg religious province of the Friars Minor, and definitor-general.In 1523 he was appointed inquisitor for Germany (the Holy Roman Empire). Schatzgeyer energetically opposed the new doctrine as heretical errors, both in word and writing. It is in great part due to him and his confreres that the Catholic Faith held its ground in southern Germany, and that the Bavarian Government strenuously defended its cause. Within a few years he published upwards of twenty-three works in which he defended the Catholic position on such doctrines as grace, the veneration of saints, monasticism, the indissolubility of marriage, the Mass, purgatory etc.He died at Munich in 1527.His writings have received the highest praise from John Eck, who collected and published them at Ingolstadt in 1543.